Have you heard about Give Big Day? It's a young and growing movement. Communities come together and raise money for local nonprofits during a single 24-hour period. And they raise a lot of money. For instance, my adopted hometown of Bozeman, Montana raised nearly $240,000 on its first-ever Give Big Day in 2015. Now, have you heard about Give Big 2016? As the concept has grown, more communities are participating, which means more donors - and more donations. As a result, this year, donation sites were overwhelmed on Give Big Day (May 3, 2016). All across the country, donation pages were sluggish. Many users received error messages when trying to give online. Others reported being double-charged when they gave online. One major fundraising platform even crashed, making the system unavailable to donors for most of the day. This included Bozeman and the Gallatin Valley. The organizers had previously announced Bozeman's goal: raise $300,000 during the 24-hour giving event. And giving had started at 12:01 a.m. I woke up that morning to see $67,057 already on the community tote board. I continued to watch throughout the morning, but the numbers didn't change. And when I tried to make my own donation, I couldn't. Later, I talked to Bridget Wilkinson who is the executive director of the Bozeman Area Community Foundation. Bridget and the community foundation lead Give Big Gallatin Valley each year. "I had spent months preparing for every scenario," she told me. "And unfortunately, this one was out of my hands." By mid-morning, when it became apparent that the national Give Big online giving portal wasn't working, event organizers across the country began canceling their Give Big Day. But not Bozeman. And not Bridget. In about 20 minutes, Bridget says, she and her team had come up with their Plan B. And it worked. Three days later, the preliminary total was announced. Not only did Gallatin Valley meet its $300,000 goal, they crushed it. Here's what they did. And, just like Bozeman, you can raise more money when you apply these five overarching themes to your fundraising. During Gallatin Valley's first Give Big Day in 2015, donors were directed to an online giving portal. Bridget learned that, while many liked the convenience of using their credit card, some preferred to write a check. So, for Give Big 2016, Bozeman area donors were given the option of writing a check or using their credit card. With the introduction of the new check writing option, one of the local banks offered to act as a Check Donation Station. Donors could drop off their checks at the First Interstate Bank downtown all day during regular business hours. Additionally, pop-up donation sites offered the ultimate in convenience. Instead of asking donors to go out and find a giving location, these "donor lounges" were located where the people were. Venues ranged from a popular wine bar at midnight, to a gym at 7AM, to retailers and restaurants throughout the day. To encourage giving, many donor lounges offered discounts or promotions when you made your Give Big donation at their location. The donor lounges were also equipped to accept checks as well as credit card donations. However, due to Kimbia's system outage, it wasn't possible to process credit cards as originally planned. So, Bozeman came up with two alternatives. First, a local company offered its office and call center employees to serve as a phone bank. Foundant Technologies' employees staffed the phones all day, taking credit card and donor information. After hours, community volunteers were on-site at Foundant, taking calls  and donations  until 9PM. As another, donors were directed to the Bozeman Area Community Foundation's website and giving page. Once there, they could make a single, secure, online contribution and designate it to any of the more than 130 participating charities. Early on, when problems began, Bozeman's organizers started communicating with the participating nonprofits by phone, email and social media. The nonprofits then used their reach to contact and update their own supporters. Throughout the morning, organizers continued to use social media to keep people posted on what was happening. They started using the hashtag #glitchwontgetusdown, and they even hinted that Plan B was in the works. In an official email in the noon hour, organizers promised, "In the event that Kimbia is unable to repair the site by 1:45 p.m., we are going transition to alternative donation plans." Right on schedule, Bozeman's organizers announced a clear and complete plan. With Plan B, donors had the option of going to the bank's Check Donation Station, or calling the newly established phone bank, or making an online donation online via an alternative giving page. And all three options allowed donors to make one gift and designate it to multiple charities - just as the original system was designed. It didn't take long for the word to get out. Between email from the organizer, social media shares as well as community buzz, Gallatin Valley residents knew exactly where and how they could give on Give Big Day. Bridget had a team supporting her from the beginning  from the early planning stages, to the event execution, to when she decided to call an audible to try and meet the original $300,000 fundraising goal. The end result? Bozeman area community members gave more than $433,000 on Give Big Day 2016. That's 82% more than last year's total and 44% more than this year's goal. But Give Big Day didn't end for Bridget on May 3rd. During the days that followed, a legion of volunteers donated their time to process checks, manually enter donations in the accounting system, even calling donors to ensure that their gifts were being allocated properly. "Without this team of volunteers, this day simply would not have been possible. And I very sincerely mean that," Bridget said. The event organizer and her team put their donors' wants and needs first. They spent countless hours planning the 2016 Give Big Day. Then, when the situation changed and was outside of their control, they worked together to identify new possibilities and quickly put a Plan B into place. There's a saying about ducks when they swim: They look calm on the surface when they're really paddling like crazy underneath. That saying accurately portrays Bridget Wilkinson and the Give Big Gallatin Valley team on May 3, 2016. Bridget shared, "I learned that it's easy to be a leader when things are going well. It's a whole different ball game when you want to crawl into a hole and hide, yet you have to make very hard decisions." "Our team made some critical decisions early on that I believe not only helped our day to continue - but helped it thrive." To get you started, here are some ideas about what other communities did on Give Big Day 2016. Send me a message and weigh in on these options or suggest your own. 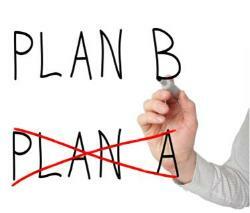 What's your Plan B?